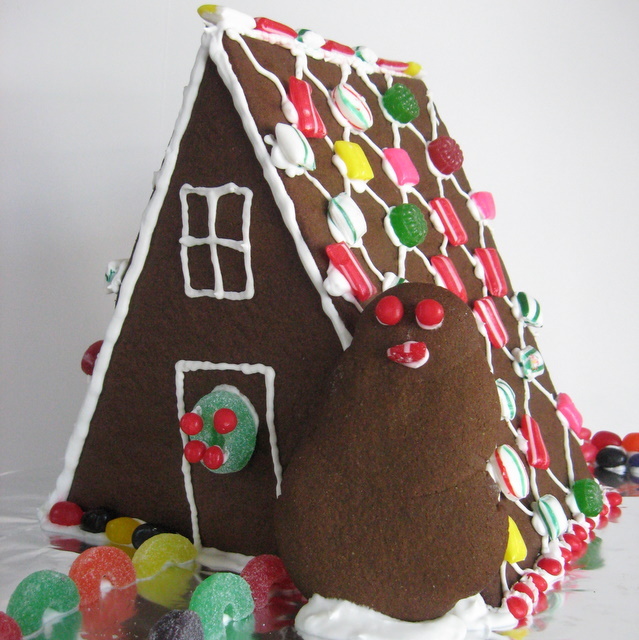 Have you heard about the gluten-free gingerbread house contest being held by Kim at Cook It Allergy Free? Kim is giving away the amazingly generous prize of a 4th generation iPod Touch. And, wouldn’t having one of those just make the day of your average 7 year old techno-geek, like my kiddo? Honestly, I think that the prospect of getting to eat a whole bunch of candy was more enticing to my kiddo. But, whatever the motivation, the kiddo and I had a grand time baking together and creating our first ever gingerbread house. He picked out the design. He helped make the dough. He supervised the rolling and cutting. He designed and created the snowman. (Totally his idea!) He came up with the decoration ideas on the house (based on ones he saw in the books we got from the library). I manned the pastry bag of frosting (it was too hard for him to squeeze it), but I put the frosting where he directed. He applied all the decorations. He’s pretty proud of it. He likes the doggy door and the “dog wall” in back the best. We used the recipe from Adventures of a Gluten-Free Mom, and though I haven’t actually eaten any, the boys in my life tell me that it’s delicious. It was certainly easy to work with and smells spectacular. There’s still time to enter. Photos of your house must be mailed to Cook It Allergy Free by December 9th. Hop to it! 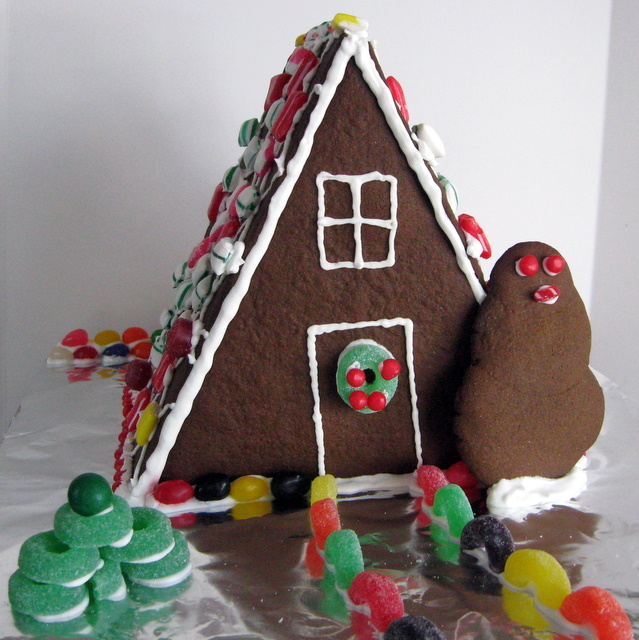 This entry was posted in Blogger Community, Contests and tagged Christmas, contests, cookie, decoration, gingerbread. Bookmark the permalink. I love the design he chose! Soooo cute. And that snowman rocks! Callum is ready to start eating ours! You guys did such a great job. Your son makes a fine architect. 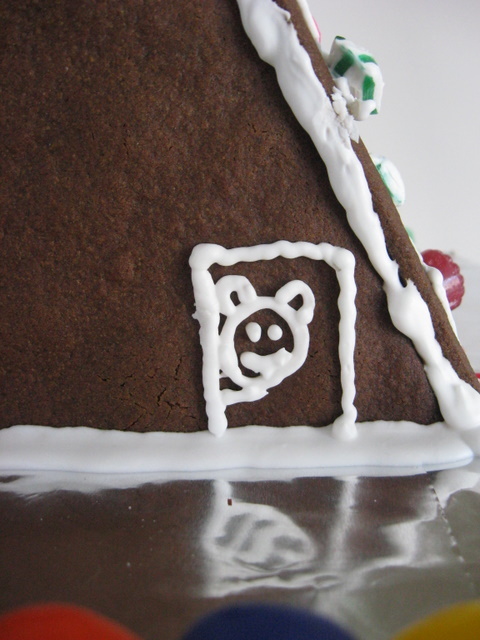 I too love the doggy door; I’m also kinda partial to the yeti, er… snowman in the front. A D O R A B L E.
I love your & the kid’s house a lot!! It is so COOl & apart!! the roof is rocking, colourful & the dog’s door is cute too!